Why did WSDOT build bridges on I-5 over Fisher Creek? Fisher Creek, located about five miles south of Mount Vernon in Skagit County, passes under I-5 and used to run through an 8-foot diameter culvert. The culvert was rusting out and some of the soil west of the southbound paved shoulder was washing away. It also created a barrier to fish passage because the water moved too fast for fish at high water times, and was too shallow during low water times. In 2013, the U.S. District Court for Western Washington ruled that the state must remove culverts that block fish passage under state roads. Fisher Creek is one of more than 1,000 in this state subject to this ruling. Removing the culvert, building twin 110-foot-long bridges and reconstructing the creek bed to a more natural state allows for better fish passage. Why didn't WSDOT just put in a new culvert? 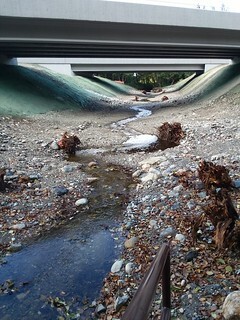 The normal width of the creek at peak flow is about 30 feet, which is too wide to fit into a standard culvert. What were the challenges to building bridges for I-5 over Fisher Creek? Keeping traffic moving: I-5 remained open in both directions during construction work. WSDOT contractor crews started the project by building two bypass lanes in the I-5 median. Southbound traffic used these lanes during construction of the southbound bridge and then northbound traffic during construction of the northbound bridge. Both directions are now back in the normal lanes. Narrowing the interstate from three to two lanes: At Fisher Creek, I-5 has three lanes in each direction that are separated by a wide median. Crews built a median bypass and reduced speeds from 70 to 60 mph to keep the 59,000 vehicles who use this stretch each day, moving during this work. Working near wetlands: Contractor crews needed to be careful working near and above the creek to keep any construction material and sediment out of the creek and wetlands. Lane reductions: Drivers prepared for lane reductions that started well before the construction zones. I-5 narrowed from three lanes to two, then expanded back to three once motorists pass the work zone. Reduced speeds: During construction, the speed limit through the work zone was reduced from 70 to 60 mph. How was the work performed? While southbound traffic was diverted on to the bypass lanes, crews removed a section of all three southbound lanes and shoulders of I-5, removed some of the underlying fill, and built a new bridge. Traffic was then returned to the regular lanes. Crews then diverted northbound traffic onto the two median bypass lanes and followed the same steps to build the northbound bridge. Crews then removed the bypass lanes, remaining fill and existing culvert, and built a more natural creek bed for Fisher Creek. They also planted the new creek banks with native vegetation. Building two bridges to replace the Fisher Creek culvert has restored the creek to a natural state, opened up more than 17 miles of fish habitat for salmon and steelhead and complied with the U.S. District Court ruling. This project will improve fish passage and open up additional salmon and steelhead habitat. The work will help WSDOT comply with the U.S. District Court ruling regarding fish passage. Winter 2016: Advertise project for competitive bidding. Spring 2016: Begin construction of the bypass lanes in I-5 median. Summer 2016: Temporarily diverted southbound I-5 to bypass lanes. Late fall 2016: Returned traffic to southbound I-5 regular lanes. Summer 2017: Returned traffic to northbound I-5 regular lanes. Summer-fall 2017: Remove bypass lanes, restore Fisher Creek bed.